95 min. Associated Film Distributors. Director: James Frawley. Cast: Charles Durning, Austin Pendleton, Scott Walker (II), Edgar Bergen, Milton Berle, Dave Goelz. After hitting big on TV's The Muppet Show (not to mention Sesame Street), Jim Henson's Muppets were destined for a shot on the big screen. In 1980, they got it in The Muppet Movie. The story of "approximately...how the Muppets really got started," The Muppet Movie is a meta kid's movie, functioning as a next-generation heir to The Wizard of Oz and pointedly telling the story of its own existence as a film. Beginning in a studio screening room, where "The Muppet Movie" is about to be unveiled to its own cast, The Muppet Movie zooms into itself, where Kermit can be found singing and playing banjo in a deep-south swamp. The film's fine opening number, "Rainbow Connection," gives Kermit his own "Over the Rainbow," laying out as it does his commitment to sun and color and imagination (the song also scored an Oscar nomination for Paul Williams and Kenny Ascher). Learning that World Wide Studios is looking for "frogs wishing to become rich and famous," the plucky Kermit sets off for Hollywood. Along the way—a la The Wizard of Oz—Kermit invites new friends to join him on his road trip. At the El Sleezo Cafe, the frog befriends Fozzie Bear, a horrible stand-up comic. When the two get into Fozzie's Studebaker ("A bear in his natural habitat," Fozzie muses), they sing their version of "We're Off to See the Wizard." Henson (as Kermit) and Frank Oz (as Fozzie) demonstrate their chemistry and high level of performance in the utterly charming, road-tripping "Moving Right Along." Trouble is nipping at their bumper in the form of Doc Hopper (Charles Durning), a fast-food frog-leg purveyor who wants Kermit as his adorable, green spokesfrog. If Kermit won't agree, Hopper can always serve him up for dinner, a prospect that doesn't sit well with Kermit or Hopper's nervous assistant Max (Austin Pendleton). Meanwhile, Kermit's contingent grows to include Gonzo the Great (a "whatever" performed by Dave Goelz) and diva porker Miss Piggy (also Oz). Williams and Ascher's songs are the best of all of the Muppet films. Henson does a loveable duet with himself when Kermit and Rowlf the Dog sing "I Hope that Somethin' Better Comes Along," Dr. Teeth and the Electric Mayhem power through "Can You Picture That? ", and Piggy hams up the tone-deaf love ballad "Never Before, Never Again." Gonzo's "I'm Going to Go Back There Someday" is not only a beautiful ballad, but also a curiously existential song for a family film: "Part heaven, part space, or have I found my place?...I've never been there, but I know the way./I'm going to go back there someday." Director James Frawley keeps the film moving, despite the threat posed by fifteen "Special Guest Stars" (including Milton Berle, Mel Brooks, Madeleine Kahn, Cloris Leachman, Bob Hope, Richard Pryor, and Steve Martin); remarkably, the cameos are well-integrated and funny. Much credit is due to the screenplay by Muppet Show head writers Jerry Juhl and Jack Burns. Their light touch effortlessly manages heartwarming sentiment and groan-worthy gags (following a bike accident, Kermit croaks, "If I couldn't hop, I'd be gone with the Schwinn"). The Muppet Movie is Henson's autobiography, writ in celluloid, felt, and (invisible) blood, sweat, and tears. Like the sweet-natured but often put-upon Kermit, Henson gathered friends to form a company, craft entertainment, and win the attention of a producer and a broad audience (Henson pays tribute to his inspiration—ventriloquist Edgar Bergen, who filmed a cameo shortly before his death—and patron Sir Lew Grade, represented on screen by Orson Welles' Lew Lord). The film's presumed endorsement of the Hollywood "dream factory" (or as the finale calls it, "The Magic Store") would be gauche if Henson didn't prove it true with his own purity of intent. Besides, it's no picnic winning fame and fortune: Kermit must dodge an immoral, commercial-minded opportunist and troubleshoot a self-absorbed girlfriend who'd sooner take a call from her agent than sit through a romantic dinner. But the rewards of love, appreciation, and the satsifaction of spreading joy are significant. Besides, Williams and Henson wield Hollywood as a postmod metaphor for a rewarding life of the mind, in any social arena. "Life's like a movie, write your own ending, keep believing, keep pretending," sing the Muppets (in earlier scenes, the Muppets consult the screenplay to decide what to do next). Self-determination is a worthy enough goal, but Henson and company better it by encouraging happy, peaceful unity with like-minded individuals, described in "Rainbow Connection" as "The lovers, the dreamers, and you." Elderly heckler Waldorf (of Statler and Waldorf) says of "The Muppet Movie" "I've seen detergents that leave better film than this," but I side with Dr. Teeth, who calls it "a narrative of heavy-duty proportions." Few family films have the breadth of appeal of The Muppet Movie, the best screen evidence of the Muppeteers' dedication to magnificent illusion, and a healthful celebration of fun and philosophy. 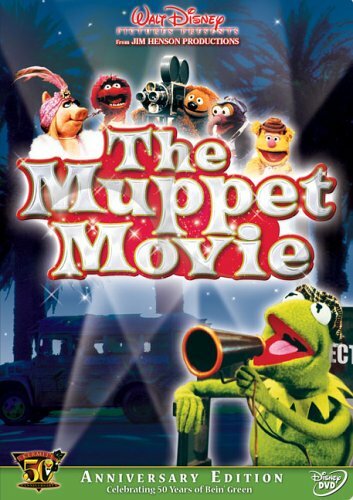 The Muppet Movie was previously released by Columbia/Tri-Star Home Video, but Disney's new Kermit's 50th Anniversary Edition features a slightly improved transfer (the film will always look grainy), muddy-sounding 5.1 sound mix (the equally muddy Columbia disc also offered a 2.0 English track), and new featurette "Pepe Profiles Presents—Kermit: A Frog's Life" (6:33). The latter is a short bio and interview with Kermit (played, since Henson's death, by Steve Whitmire). Columbia's disc offered two minutes and twenty seconds of "Muppetisms" (promo spots not contemporary to the film) and, more importantly, thirteen minutes and thirty seconds of camera tests conducted by Frawley. It's possible that the footage isn't available to Disney, but the dearth of significant bonus features makes the new disc a bit disappointing. Perhaps one day the film will get a proper special edition that removes the extraneous fullscreen transfer to make way for a full battery of special features. All site content © 2000-2019 Peter Canavese. Page generated at 04/23/2019 03:05:09AM.